A pioneer in easy to use video conferencing on the desktop, Skype is now rumored to be bringing video calls to mobile devices, offering competition to Apple's FaceTime. Skype has reportedly been saying it has a "series of video-related announcements" to make a next month's Consumer Electronics Show, according to a report by Engadget. The company is also scheduled to be represented in a panel discussion entitled "Video Calling Gets Ready for Primetime" at the conference, and the report noted that Skype advertised via email this morning a new support document that tells users how to make video calls via iPhone. While there's no parallel documents that provide the same kind of instructions for mobile users running Android or Symbian, it seems likely that the company would want to roll out video features on as many of the mobile platforms its existing VoIP and text chat work on as possible. Skype already offers limited video chat support on the Linux-based Nokia N900, but hasn't expanded the ability to video chat outside of that device on other mobile platforms it supports with a Skype client. Apple's release of FaceTime video calling in conjunction with the iPhone 4 launch this summer received some criticism from users who took issue with the company's suggestion that the new feature represented a first, noting the video calling features long built into many European phones and the front facing video cameras appearing on a few Android models such as the HTC Evo 4G. What was new about Apple's FaceTime is that it is built using open standards that other companies can implement for interoperability with both mobile and desktop systems. Apple released its own support for Macs and the latest iPod touch, and is expected to add the feature to its second generation iPads early next year. All of the components of FaceTime leverage existing IETF standards and familiar codecs such as H.264 video and AAC audio. Existing mobile video chat based on telephony standards is not only much poorer quality and so more expensive to use that it is not in common use, but is also tied to mobile networks, and therefore can't interoperate with desktop computers to set up mobile to PC video connections the way FaceTime can. 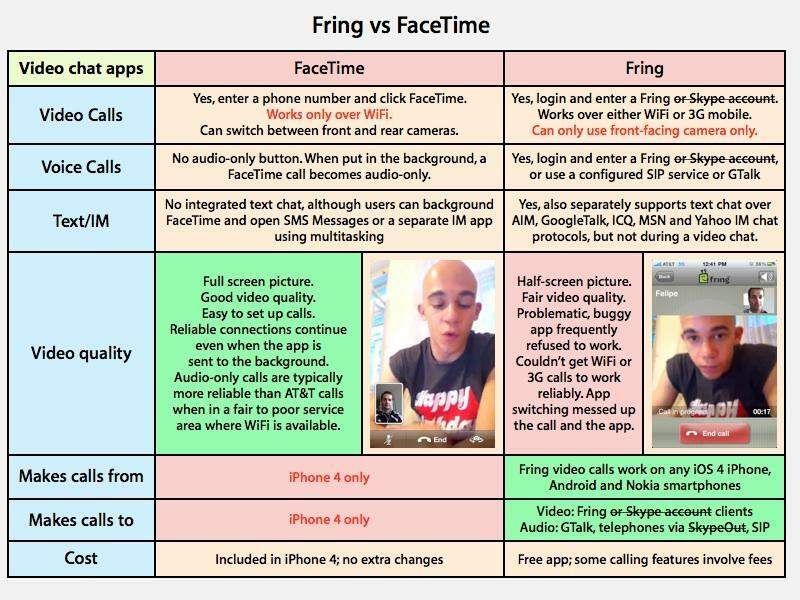 The video calling hardware Android licensees have added to their own devices lacks a software analog to FaceTime from Google, leaving Evo users to rely upon third party tools such as Fring. It's service can work over 3G networks in addition to WiFi, an advantage over Apple's WiFi-only FaceTime. However, Fring also delivers less quality and is much less reliable. It also requires users to set up a new account, as the existing video chat networks (including Skype, Yahoo, MSN and AOL) are built upon proprietary technologies that can't work together. Fring attempted to piggyback on Skype's network to offer Skype users the ability to set up video chats on mobile devices using their existing accounts, something Skype itself does not yet support. However, Skype retaliated by blocking Fring from working with Skype accounts, saying the company had failed to uphold its licensing agreement in relation to tapping into the Skype network and suggested the company was making Skype's brand look bad because of its poor performance. Skype recently suffered a major outage of its own that prevented even paid desktop callers from begin able to use the service for an extended period. The availability of the basic Skype client on Android was also held up over an exclusive app deal Skype made with Verizon, which limited Skype from working with Android phones not connected to Verizon's network. At the launch of FaceTime, Apple's chief executive Steve Jobs said the company would be publishing open specifications for FaceTime that would enable other companies to build interoperable video chat clients. Over the last six months, no new information about this has surfaced, but competitors have also largely failed to offer any competition in the mobile video calling arena. Apple's FaceTime for Mac, currently in beta, may be among the first titles available in the company's new Mac App Store, suggesting the potential for Apple to shift attention toward the emerging standard and perhaps leverage the attention that will be directed at the new software download site to broaden the mindshare of FaceTime as a cross platform standard. If Apple can successfully establish FaceTime as a popular open standard, it will solve an existing problem plaguing instant messaging systems: the fact that existing chat users need to create multiple accounts to chat with others on different chat networks (such as AIM or MSN). A similar use of open standards has enabled email users to trade messages with other users on different email servers made by various vendors with few interoperability problems. Apple's iChat and Google's GTalk have been pushing open IM using the open XMPP standard, but Apple is the only company taking a leading role in pushing open video chat using an extension of many of the same open standards. Skype made an early comment supportive of FaceTime, but it appears that the company intended to mean that it would bring Skype video chat to iPhone 4, rather than incorporate FaceTime-compatible calls in Skype. The latter would bypass Skype's proprietary network, which represents most of the company's value. Skype's network isn't open, but reportedly uses a distributed P2P-like network for arranging calls between its users while FaceTime uses conventional point-to-point links, offering little apparent room for combining the two together in any sort of partnership.